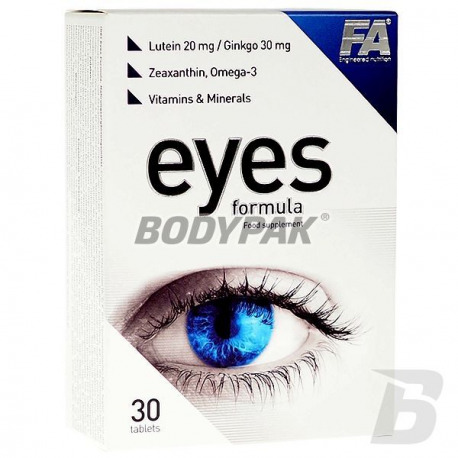 Health & BeautyFA Nutrition Eyes Formula - 30 tabl. Fill your diet with substances that affect the proper functioning of your eye (lutein, zeaxanthin), and omega-3. To strengthen the preparation enriched him with an extract of ginkgo biloba. With proper care of your vision you are able to secure his long and trouble-free operation. Thanks to the proposal by FA Nutrition is easier than usual - appropriate the qualitative and quantitative guarantees the desired effect. 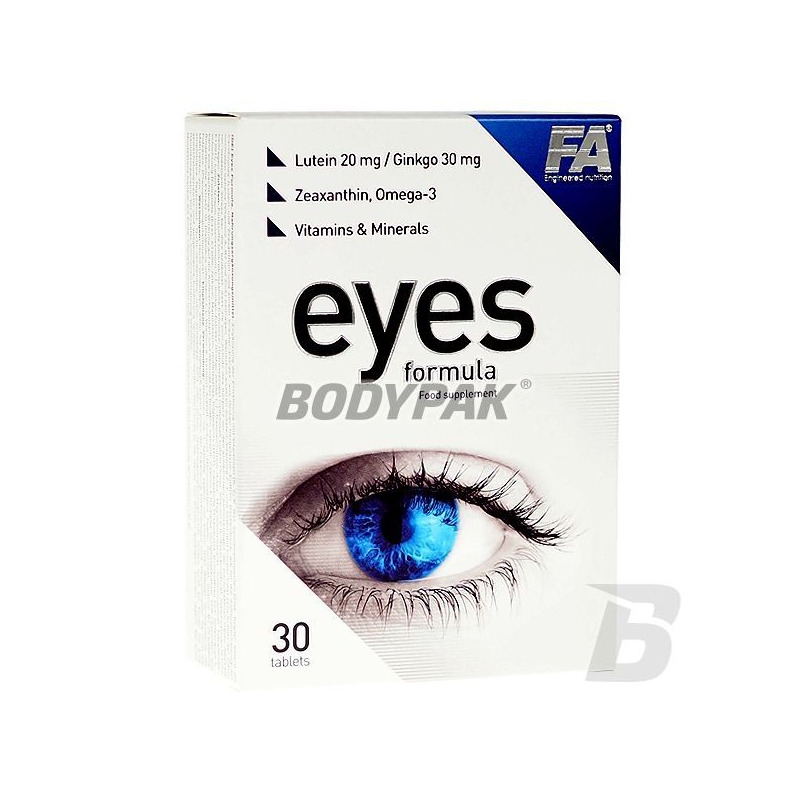 FA Nutrition Eyes Formula is a dietary supplementing the diet with vitamins and minerals that help maintain normal vision enriched with carotenoids (lutein, zeaxanthin), omega-3 and extract of ginkgo biloba. The product is recommended above all others sentient eye fatigue and blurred vision resulting from long hours especially at the computer, long reading, improper lighting, watching TV, driving a car at night and exposure to unfavorable to the sensitive organ of external factors such as UVA and UVB rays, oxidative stress, smoking, Overeating junk daily diet. Vitamin A helps maintain normal vision and helps in the proper functioning of the immune system. Vitamin C helps in the proper functioning of the nervous system, helps to maintain normal psychological functions, contributes to a reduction in tiredness and fatigue and helps protect cells from oxidative stress. Vitamin B2 helps maintain normal vision and helps protect cells from oxidative stress and contributes to the reduction of tiredness and fatigue. Folic acid helps maintain normal psychological function, helps in the proper functioning of the immune system, contributes to the reduction of tiredness and fatigue. Zinc helps to maintain normal vision, helps in keeping the immune system, helps to protect cells against oxidative stress, contributes to maintenance of normal metabolism of vitamin A helps in normal protein synthesis and is involved in cell division. Selenium helps in the proper functioning of the immune system and helps protect cells from oxidative stress. Copper helps in the proper functioning of the nervous system and immune system, helps protect cells against oxidative stress. Lutein and zeaxanthin are natural colorants present in high levels in the macula of the human eye, the most sensitive point of the retina. The macula functions as a special filter that protects the retina from the harmful effects of exposure to visible light and blue, and protects against harmful UV rays, which allows you to maintain full fitness visual apparatus. Lutein and zeaxanthin accumulate also in large quantities in the lens of the eye, effectively protecting it from changes intensified with age, especially after the age of 40 years. These natural substances are not synthesized in the human body and should therefore be provided in the form of a daily diet or supplementation of. Lutein is an important component for maintaining good vision and visual acuity, supports vision and protects your eyes. Zeaxanthin used at a dose of 1-3 mg per day in combination with lutein contributes to maintaining eye health and supports a normal vision. Zeaxanthin protect the eyes by absorbing blue light and neutralize free radicals further improves visual acuity in low light. The extract from the leaves of ginkgo biloba (Ginkgo biloba L.) is a plant which is assigned effect on improvement of cerebral blood flow thereby increasing the supply of oxygen to the brain and other nutrients. Ginkgo extract helps maintain normal psychological functions, helps to maintain the proper memory and cognitive function with age. FA Nutrition Eyes Formula - FORCE OF NATURE IN YOUR HANDS! Ingredients: Fillers (microcrystalline cellulose, hydroxypropyl cellulose), powdered lutein, vitamin C (L-ascorbic acid), stabilizers (E1202, E1201), linseed oil (Linum usitatissimum L.), leaf extract of ginkgo biloba (Ginkgo biloba L.), anti-caking agents (E464, magnesium stearate, silicon dioxide) coating the tablets [bulking agents (E464, E1200), talc, maltodextrin, medium-triacylglycerols (MCT), pigments (titanium dioxide, brilliant blue, yellow orange - may have adverse effect on activity and attention in children)], vitamin E (acetate, D-alpha-tocopheryl), extract of flowers of marigold (oil containing 10% zeakstantyny) (Calendula officinalis L.), vitamin A (retinyl acetate) oxide zinc selenate (IV), sodium gluconate, copper (II), vitamin B2 (riboflavin), folate (folic acid). Guaranax is highly energizing extract of a tropical plant grown in Brazil (Paullinia cupana), which is one of the richest in the plant sources of purine alkaloids, among others, caffeine.